BRIGHTON, Mich.- Your Ford Dealership Serving Livingston County is excited to announce that we will be hosting the 13th Annual Window Painting Event at Brighton Ford! We're so excited to have the local elementary students back for another year to paint our windows with festive scenery. The little ones will be painting the windows at Brighton Ford from December 4th-6th, so make sure you stop by to check out all of their hard work! Then don't forget to come back on December 19th for the Big Holiday Window Painting Event at Brighton Ford! During this night filled with family fun, you can vote for your favorite window painting and help the local schools win $3,000, $1,000, or $500 all donated by Brighton Ford! Plus, you won't want to miss out on the 42" TV Raffle, Food, and Games....And did we mention SANTA WILL BE AT BRIGHTON FORD? You heard that right! Santa will be back for another year too, taking pictures and accepting all those letters to the North Pole! 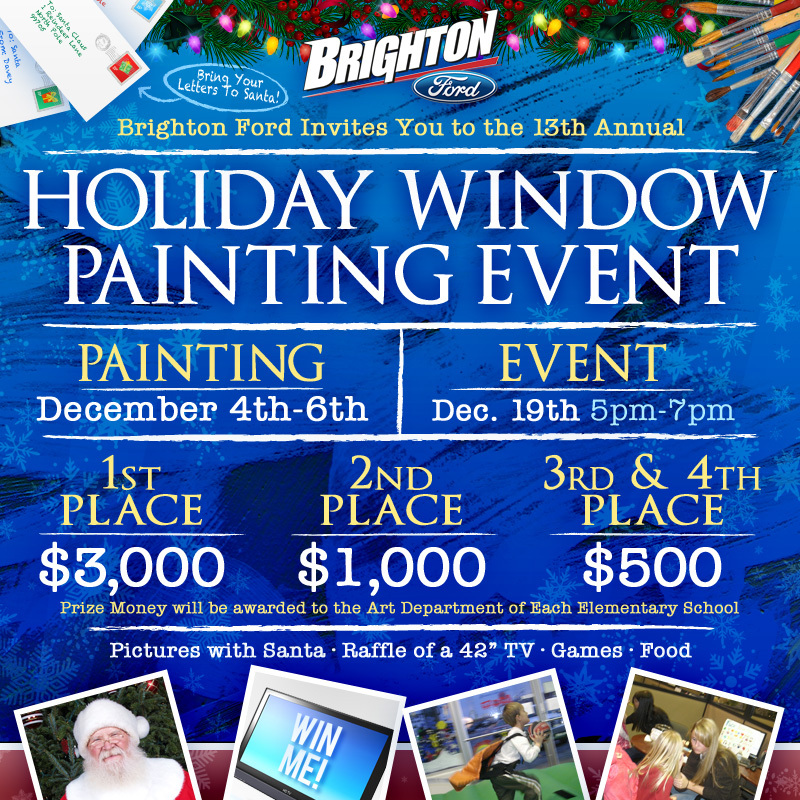 Kick off the holiday season the right way with Brighton Ford's Window Painting Event with the local elementary schools! If a Used Vehicle is on your Christmas List, Brighton Ford has a great inventory of Used Ford Cars For Sale in Brighton as well as many other makes and models! Come on by, we're located at 8240 Grand River Ave. just north of I-96 in Brighton. We are a family owned and operated business that strives on customer satisfaction. For more information on Brighton Ford visit BrightonFord.com or give us a call at (800)-836-8206.